It's already started, this thing called social influence. Or peer pressure. From the five and six year old, hip-high crowd. Sometimes it's over toys or treats. It's never really over clothes or shoes (thankfully, they all wear standardized dress/uniforms). Lately, it's been about something else. Something worse. There's been desperate begging in the grocery aisles, which I have blatantly ignored. There have been emphatic declarations of, "But, Petunia, Zinnia, Clover, Violet and Milkweed* eat them all the time, Mom!!!!" Which fell on deaf ears. They were the very first things she showed to me when she came home. She also opens the refrigerator at regular intervals to check on them. Could they BE more disgusting? Are they even real food? The pizza box not only contains a round cardboard-like base, cheese, pepperoni and tomato sauce in a pouch (that's only asking for a messy disaster to strike), but also cookies, Cheese Nips, a bottle of water and a Kool-Aid mix pouch. Can you say carb? Can you say sugar? Can you say unbalanced? The nuggets, or dunks as they call them, are equally revolting. I have explained to her that both of these would have to be eaten either cold or room temperature, the very thought of which summons my gag reflex,----and she STILL wants to take them for lunch. All because her friends eat them. ***All names, except for Annelise, have been changed to protect those Kindergartners guilty of eating vile Lunchables. Sometimes food allergies come in handy. Good luck with that, Holly. Oh gross, these sound nasty, especially cold. I'd let her eat them because the grandparents bought them, but I would let her know this is an exception and that they're not good for her to eat all the time (even if her friends do!). Whitney always wants these too, but I've never bought them for her. I was just reading a blog last week where the mom said she buys them for their birthday lunch at school, and I thought that was a plan I could accept. Let her eat them, as a treat from grandparents, and then tell her that you won't be buying them regularly. 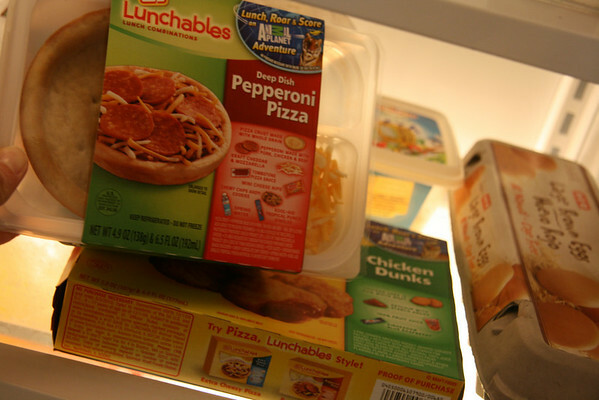 Just like candy or juice is a treat (at least in our house), so can Lunchables be a treat. I have only bought them for my kids a couple of times, usually when desperate for something quick and easy in the car or something. I find them unappetizing as well. Once she tastes them, the appeal might wear off. Oh, and my kids have only had the cracker and lunch meat ones, because I can't handle the potential mess factor of others. I would love to chime in on these. I am a teacher and I see these all the time. They are banned at my house. Often I might cute up lunch meat and send in some cheese to substitute. Is it because she is getting bored with lunch options? I started sending in leftovers and other things I could heat up in a thermos. They think it is pretty cool to have a hot lunch once in a while. Would she up for that? Maybe she could start a new trend? Good luck with the lunch battle. Many other moms have fought it before us. I'll probably let her eat the pizza one, but not sure I'll let her take it to school--although I know that's 95% of the point. I just think it'll be sooooo messy and might even be a pain for the lunchroom helpers (to help her open those annoying packets). The hot lunches at her school at crazy expensive, like $3 or $4 dollars each, so I don't want to go there. OK, I have been guilty of buying these for my kids as a treat occasionally. We have had the same begging in the aisles. If I sent cold pizza for lunch they would have a fit! But somehow eating these cold pizzas is fun. Go figure. The chicken dunkers are a joke, I think there are only 4 of them. You could reserve the meals for eating at the grandparents. Send her over with her own lunch. Maybe everyone will get the message. ha! The pizzas are very messy and often times the kids spend more time putting them together than eating them. BriteCloud: I have bought the ham/cheese & cracker versions before, but never pizza etc. I guess it's fun, but ridiculous.